By LUDWIG VON KOOPA - Also one year as a Miiverse user. March 24, 2013. I paid a friend of someone I knew $300 to get a Wii U Deluxe with Nintendo Land and New Super Mario Bros. U, along with all the nice stuff that came with it. They didn't actually use their Wii U for some reason, and factory-reset it for me. So it was pretty much good as new when I got it. The GamePad was an absolutely new and amazing experience for me. "Wow, it's really light to hold! And it actually feels good to hold too!" Back at E3 when they showed it I thought it would pretty much be a rectangular prism. In other words, an uncomfortable brick. Nope, it feels great. So I got my NNID, PrinceOfKoopas, and started playing Nintendo Land. 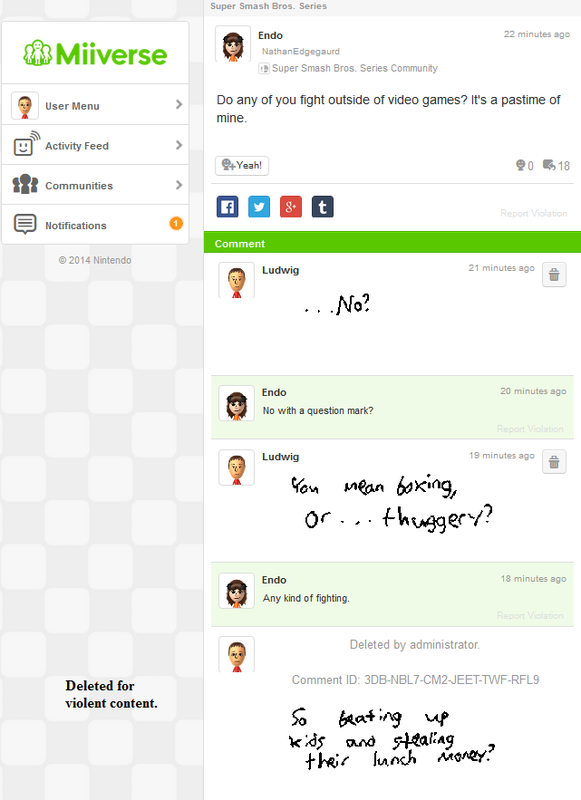 And... it was pretty amazing to witness that Miiverse integration. So much so... I made a Miiverse post about it! Since then, I had fun with Ubisoft's Rayman Legends: Challenge App, which was absolutely free. I also spent a lot of time just playing that, Nintendo Land, and Miiverse. Eventually I decided to actually play New Super Mario Bros. U, and I immediately bought EarthBound when it was made available. Target had a "buy 2 get 1 free" deal and I picked up Rayman Legends to thank Ubisoft, and Pikmin 3 and The Wonderful 101. And now I have Donkey Kong Country: Tropical Freeze, too. Nintendo has a fantastic system, and I really enjoy it. I have a lot of statistics to share below, so keep reading. Nintendo Land has provided me with around 35 hours of fun from 28 times of play. The Rayman Legends: Challenge App has 62 hours at 160 times played, while EarthBound sits at 30 hours at 22 times. New Super Mario Bros. U is 33 hours and 21 times, while Rayman Legends is 49 hours and 105 times. Donkey Kong Country: Tropical Freeze is a work-in-progress, currently sitting at 15 hours over 9 play sessions. Finally, Miiverse sits at almost 415 hours over 1,055 times. The killer app of the Wii U is clearly Miiverse. By comparison, my 3DS Miiverse usage is only around 2 hours because I only use it for screenshot posting. My PC Miiverse usage is... unrecorded. You can tell what OS I'm using because handwritten posts are from my Wii U, and typed messages are from my PC. Excel is really amazing. It also only has 360 days in a year. The sheet currently goes down another 200 rows. I'm going to make a mini-series (or a full series—I don't know at what point it becomes "mini") on Miiverse tips and standards to go by. But basically, I count that Followers-to-Follows ratio to be important, along with Yeahs Earned Per Post. ...Days Per Violation is also interesting, and you can find other statistics to be interesting too. If I could track how many people have blocked me, I would. Speaking for myself, I have blocked a total of zero people. Yeah, this is a big no-no. This guy is overly sensitive. He reports a lot of things. ...Endo swears she didn't report me! I also got posts deleted for posting "..." as a placeholder comment to get notifications for a quiz, and another post deleted for unknown reasons. ...I don't know what that post was because when I clicked on "view post", it said the post has been deleted! Yet I haven't been banned yet. Good. Anyway, when they're not reporting you or acting like little children, Miiverse can be pretty nice. I read every post in the Phoenix Wright: Ace Attorney - Dual Destinies community, along with Donkey Kong Jr. and the "Ludwig's Clockwork Castle" tag in New Super Mario Bros. U game posts. That latter is to see if I can find any adoring fans. One time I did and she blocked me. I also read every post on my Activity Feed. It's for this reason I'm very selective about who I accept/send friend requests to, and who I Follow. If you post too many times a day, I won't do it. That doesn't mean that you have to post as few as an average of .6 times a day like I do. Sometimes I wonder if people think I'm inactive on Miiverse because I don't post every 3 minutes or whatever. A lot of people have a lot more Followers than I do. They're either artists or they have a huge amount of people they're Following. If you see someone that Follows more than being Followed, or about an equal amount, chances are that most of those are from Follow-me-I-follow-back deals. I don't do those, just like I don't do sub-for-sub on YouTube. You'll notice I have a total of 0 subscriptions on YouTube and 298 subscribers. I'm a content creator by trade. I have faith that my content is compelling enough that I don't have to do these deals. Which is why I think I have no idea how Twitter works, given the failure of the KoopaTV Twitter. Back to the Wii U. Great system. People can claim it has no games all they want, but Miiverse is part of the package. When you add that into the value equation, it's definitely worth it. I claimed on the Wii U's birthday that Nintendo is the most consumer-friendly manufacturer, and I maintain that. The other manufacturers wouldn't offer this kind of value for free! And if the Wii U has no games, then how come I use it to play games? Spectacular games, at that. It does lack online multiplayer (unless you're into Monster Hunter), but Mario Kart 8 and Super Smash Bros. 4 promise to fix that by the end of this year. As it stands, I'm on my Wii U more than my 3DS. It's a great console, and I highly recommend it. As made clear, Ludwig's NNID is PrinceOfKoopas. Follow him on Miiverse: Then you can become a statistic on his Excel spreadsheet, too! 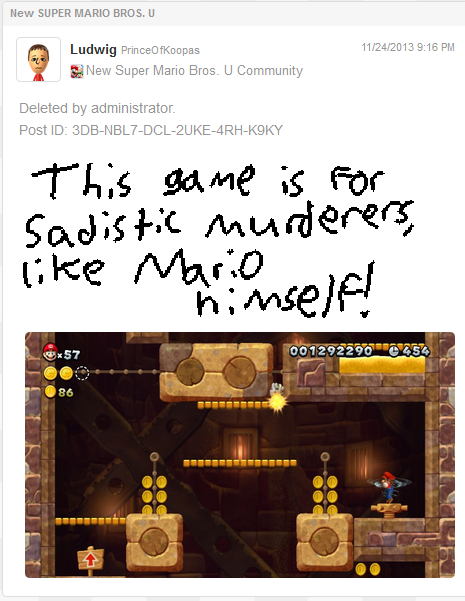 Ludwig got banned from Miiverse less than a month after posting this. Rough. If anyone wants the file for my Excel spreadsheet, I can hook you up. "Follow-me-I-follow-back" is one of the methods I was instructed to use to build up a base on Twitter. More specifically, to use the site JustUnfollow to copy the followers of someone whose fanbase I would expect to overlap with mine, wait a while to see how many follow me back, and then unfollow those that didn't. Right now I'm in that roughly-equal area you mentioned--Following 272, 282 Followers. Yo, I was wondering where you got all your Twitter followers from since they're completely disproportional to the amount of activity you have. ...Except that kind of tactic is disgusting and I won't do it. On the other hand, people on Twitter from GAFfers to George Zimmerman judge the worth of a person/their ideas by the amount of Twitter followers they have. Which is still disgusting, but maybe it's worth being disgusting to get attention? I'm pleased my number of followers has finally outnumbered the number I'm following. According to JustUnfollow, there are 67 people who follow me without me following them. 1. Even if these people initially followed you just because you followed them, they might become interested in your content. Your content is also more likely to reach them than it is to reach random Twitter people. 2. As you said, some people judge you by it. In fact, I saw a job post that listed "have at least 500 Twitter followers" as one of its requirements. For authors, it can also be a potential selling point if you have TONS of followers. 1. I actually tried to have the KoopaTV Twitter follow some random videogame-interested dudes on Rawk's suggestion. ...The amount of followers I got back were... 0? 1? And their own content sucked or was nonexistent. Yikes. The only purpose of the KoopaTV Twitter right now is to drive up views by stalking hashtags and posting inflammatory articles relating to the hashtags. 2. *shifty eyes* Are you judging me? 1. Somewhat? What's your measure? 1. That a number of people I followed have followed me back? Do those people actually interact with you in any way? Twitter sends me a report every week about my Twitter activity, including link visits. A couple of them do. Certainly not all 200+, though. Yeah, I get those, too. Although the follow-for-a-follow method is a good way to build up some numbers quickly, I may stop soon, since I seem to be developing the ability to get followers on my own. xDD At least, I've been getting new followers every week, and I haven't used JustUnfollow in a while. ...Yeah KoopaTV's Twitter is pretty close to being blacklisted. It's been blocked by countless people already! Because of your strategy of "stalking hashtags and posting inflammatory articles relating to the hashtags"? To put it another way, there's diminishing marginal returns.